Mauterndorf is a village in the Lungau area of Salzburg, in the south-eastern outskirts of the province. 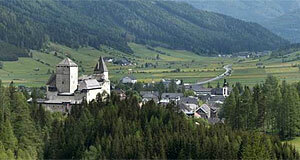 Mauterndorf has a population of approximately 1,700 and is famous for the local castle. The castle, the medical town centre of Mauterndorf and the skiing opportunities of its surroundings make Mauterndorf one of the more touristy communities in the Lungau. The name "Mauterndorf" means "toll village" and relates to a toll station that was built here in the Middle Ages. However, the history of Mauterndorf as an important strategic settlement dates back much further. The site of today′s castle was previously occupied by a Roman castle which secured a road that went through modern Mauterndorf. This road connected Northern Italy via the Radstädter Tauern mountain range with Salzburg and was an important trade route. In 1023, the Archbishop of Salzburg seized power over Mauterndorf, a toll station was built and secured by a castle in the 13th century. Archbishop Leonhard von Keutschach extended and modernised Burg Mauterndorf in the 15th century, shaping its current appearance. The castle became the administrative centre of the Lungau. It remained Salzburg′s property until the principality was secularised in the course of the Napoleonic Wars. Afterwards, it became property of the Archduchy of Salzburg which sold Burg Mauterndorf in 1894 to a wealthy military surgeon from Berlin, called Hermann von Epenstein. Now things take an interesting turn: Epenstein had a long affair / relationship with the (married) mother of Hermann Goering. He became the godfather of the latter and after his death, Goering inherited Burg Mauterndorf. The Nazi functionary owned the castle from 1939 to his death in Nuremberg in 1945. Before his arrest, Goering wanted to flee to the castle. Hermann Goering had donated money for infrastructure projects in Mauterndorf and had been made honorary citizen of the community. This honorary citizenship has never been withdrawn. In 1968, the province of Salzburg bought Burg Mauterndorf and renovated it extensively until 1982. Today, it houses a permanent exhibition of the building and its history as well as the Lungauer Landschaftsmuseum (Lungau Landscape Museum). During the main season in summer, there are special guided tours and entertainment programs for children done in Mauterndorf. On the first weekend in June, there is a Medival Fair (Mittelalterfest) held at Mauterndorf which is quite popular among tourists and locals alike. This fair extends beyond Burg Mauterndorf and includes much of the historic village centre. For sightseeing, note also the parish church St. Bartholomäus and the chapels of St. Gertrauden and St. Wolfgang. Mauterndorf is one of the Lungau villages where Samson parades are still done once a year. In the surroundings of Mauterndorf, you will find plenty of opportunities for hiking and other Alpine sports. Given the wealth of attractions that drive visitors to Mauterndorf during the summer season, you might be surprised that the majority of guests come during the winter. Of the almost 245,000 over-night arrangements that are sold in Mauterndorf every year, the vast majority is due to local skiing. Since summer guests often come only on day-trips, the winter season is significantly more lucrative for the local hotels. The skiing area at Mauterndorf is called Schischaukel Großeck-Speiereck. It offers a variety of skiing opportunties and targets primarily families.